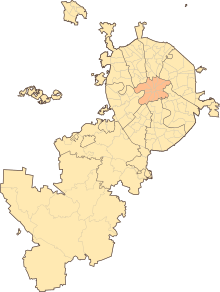 For other entities called "Central Okrug" or "Tsentralny Okrug", see Tsentralny Okrug (disambiguation). Central Administrative Okrug, or Tsentralny Administrativny Okrug (Russian: Центра́льный администрати́вный о́круг, Tsentralny administrativny okrug), is one of the twelve administrative okrugs of Moscow, Russia, located within the Kamer-Kollezhny Bank. Population: 741,967 (2010 Census); 701,353 (2002 Census). The Ministry of Education and Science has its head office in the Tverskoy District. ↑ "Federal Penitentiary Service." Government of Russia. Retrieved on 5 October 2011. "Address: 14 Zhitnaya Ulitsa, Moscow 119991"
↑ "CONTACT Archived November 15, 2011, at the Wayback Machine.." Ministry of Education and Science. Retrieved on 1 November 2011. "Address: Tverskaya street, 11, Moscow, 125993" - Address in Russian Archived November 5, 2011, at the Wayback Machine. 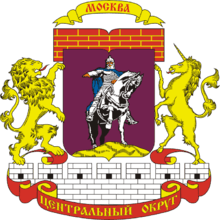 : "ул.Тверская, д.11, г.Москва, ГСП-3, 125993"
↑ "Queries." Aeroflot. Retrieved on 29 June 2010. "Legal / mailing address: # 10, Arbat street, 119002 Moscow" – "Обращение в авиакомпанию." – Address in Russian: "Юридический адрес / Адрес для почтовых отправлений: 119002 Москва, ул. Арбат, д. 10"
↑ Home page. United Aircraft Corporation. Retrieved on 8 December 2010. "Ulansky side-street, bld.1, 22 Moscow 101000, Russia" – Address in Russian: "101000, Москва Уланский пер., д.22, стр.1 "
↑ "Contacts Archived August 26, 2011, at the Wayback Machine.." (Direct map image link Archived September 27, 2011, at the Wayback Machine.) Tupolev. Retrieved on 8 December 2010. "Address in Moscow: Russia, Moscow, Academician Tupolev Embankment 17 " Address in Russian: "105005 г. Москва Набережная Академика Туполева д.17"
↑ "ANA City Offices/Ticketing Offices Europe." All Nippon Airways. Retrieved on 31 August 2011. "Moscow Sales Office World Trade Center (WTC) Room 606, Mezhdunarodnaya-2 Building, 12 Krasnopresnenskaya Nab, 123610, Moscow, Russi"
↑ "Company Info / Contact Info." Korean Air. Retrieved on 30 August 2011. "CIS Headquarters Bolshoy Gnezdnykovsky Pereulok D1/2, Moscow, Russia" Address in Russian: "Большой Гнездниковский переулок 1/2 Москва Россия"
↑ "Accueil." Lycée Français Alexandre Dumas de Moscou. Retrieved on 22 March 2014. "101000 МОСКВА, Милютинский пер. д. 7А, Французский лицей Lycée français, 7A Milioutinsky per., 101000 MOSCOU"
Wikivoyage has a travel guide for Central Moscow.